Happy Earth Day greenies! Sometimes when this day rolls around we feel that push to do something big, something green, something to help better the Earth, but I'm here to tell you it doesn't have to be as dramatic as it sounds. I'm a firm believer in the power of little things. Little things done daily add up to a lot. And when it comes to going green, it's those little things that can add up to reducing your electric bill, decreasing the toxic load in your body, and cutting down on the amount of trash going to the landfills...among other things. Look closely to see our "bib" in disguise! So today's "little thing" revolves around a common item that nearly every parent of a baby or toddler has in their home...a baby bib. 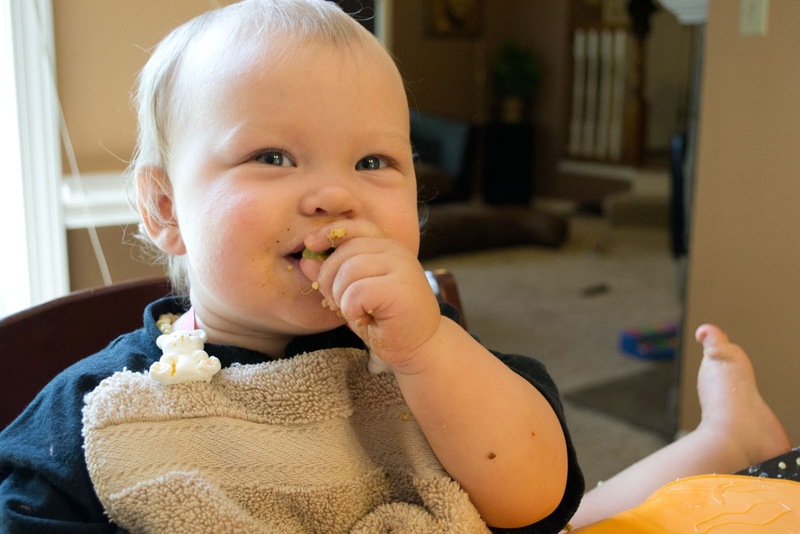 Once babies start eating solid foods, baby bibs are a must-needed accessory to keep clothes somewhat clean. There are many baby bibs out on the market now, some market themselves to be "greener" while others have fun catchy characters on them. Either way they do their job for the most part of keeping baby clothes clean. The tricky part for me came in when I kept buying them over and over and over again. I'd get a spankin' new bib for Avery when she started eating solid foods (in conjunction with breast milk) around 6 months old, and after just a few short weeks, it would look ratty and worn. I suppose I could have been more careful and delicate with washing them off, but when you've got spaghetti splattered and wiped all over it, I know of no other way to clean them than with a good rinse with soap and water. before finding the Bib Clips. 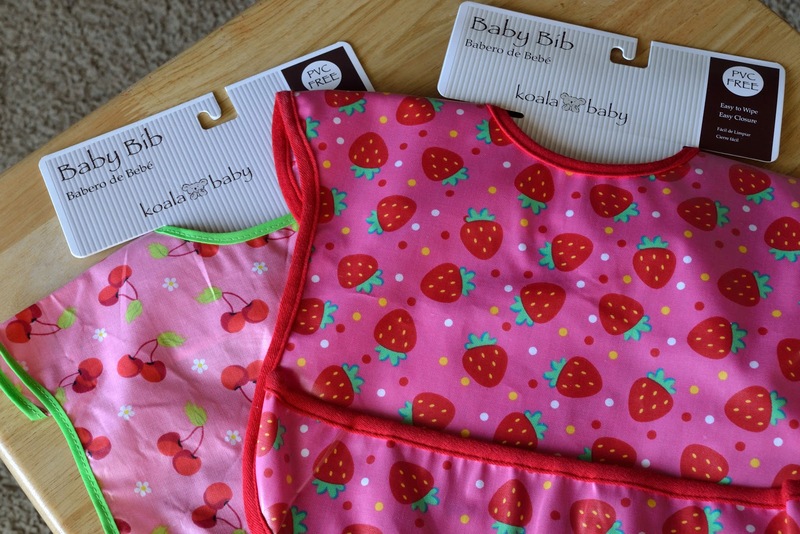 I sought out other alternatives...maybe I could make my own (no, I cannot sew), maybe I could try a different format like this one that catches the food and wipes off easy (no, it fit Avery too weird). I was literally to the point where I was considering taking some of my dish towels, cutting a whole in them and using those...luckily that's when I found Baby Buddy Bib Clips. These things are amazing! 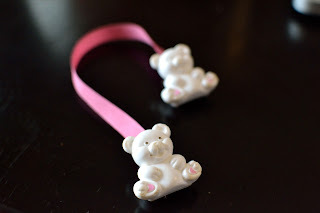 "Bear Clips" fresh from the store! Basically they consist of two clips attached with a piece of ribbon that can be clipped onto any cloth or paper napkin to make a bib. Now although this product isn't marketed as "Green Invention of the Year," I truly think that it is the greenest bib around because it eliminates the need for bibs altogether. No buying, throwing out, buying, throwing out! 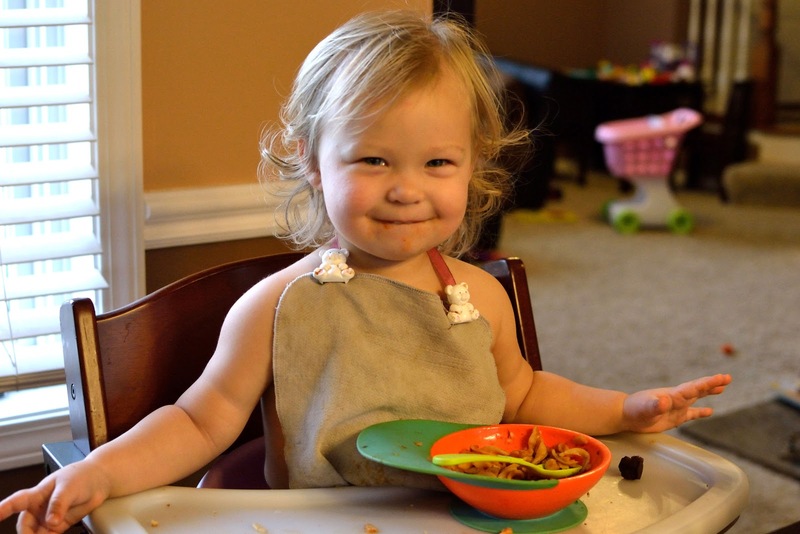 All you need is a set of Bib Clips, a stash of cloth napkins (or dish towels, wash cloths, etc.) and you are good to go. Bring on the messy meals! Only cost $5 at Buy Buy Baby, you could also get them online here. What's that foot doing up there you little 14 month old?! Look at those curls coming in! 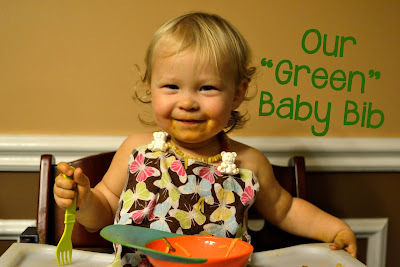 Bib clips can't do much to keep the face clean from guacamole! 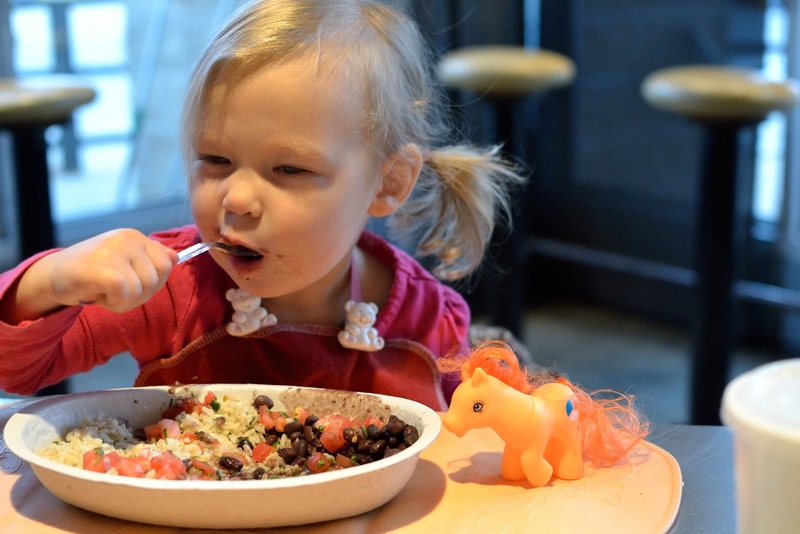 whether it's in the bowl, or out! Still going strong into her second year! As you can tell those Bib Clips sure have been through a lot of food, a lot of cloth napkins, and a lot of memories! I'm so glad to have found something that is capable of lasting so long. 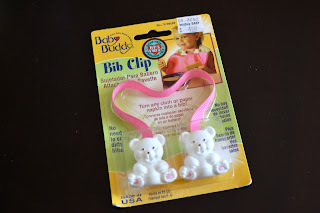 With a new baby on the way, I look forward to using these same Bib Clips again and to know that they will still be in great shape (knock on wood) by then is one more thing I can cross off my "Baby Prep List". Since these are so cheap and easy, they are great to keep at Grandparent's houses, relatives, or just in the diaper bag for when you go out. Most of the time everyone has a wash cloth, hand towel, or worst case scenario...paper towel that you could use to quickly and easily make a bib. 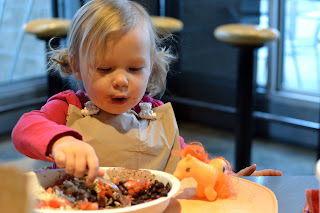 Here we are utilizing the Bib Clips at a recent outing to one of Avery's favorite restaurants: Chipotle! With our cloth napkin attached. A paper napkin could also work. So there you have it, one tiny little green tip that although it may seem small, can end up saving you money, as well as helping our environment. Have you ever tried Buddy Baby Bib Clips or something like them? I'm sure you could create something easily and cheaply...but personally I wasn't feeling that creative. What other bib alternatives or brands have you tried? How have they worked? Share your experiences below! If you're feeling like taking on another "little thing" to your green to-do list, check out my pages on how you can "Green Your Body" or "Green Your Home." And again, Happy Earth Day! Disclaimer: I purchased this product with my own money and this is my honest opinion of it. 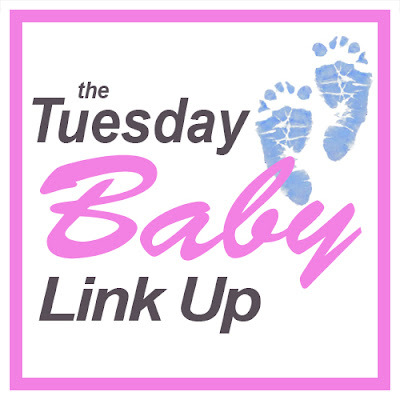 "Tuesday Baby Link Up" over at the blog Growing Slower, as well as a number of other blogs that are listed in the link above. 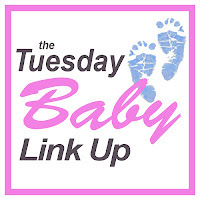 So hop on over and check out some other fun baby posts!